The 2017 Chevrolet Silverado full-size pickup finds itself in a styling and power war not only with rivals like the Ford F-150 and Ram 1500, but Nissan's new Titan and Toyota's Tundra. Even with its recent styling upgrades, the Silverado's look leans toward the conservative side, which for many truck buyers is just fine. My wife and I love the temperature zones, especially the heated seats, since I'm always hot and she's always cold. I used to have a Toyota Tundra. I love how well Toyota's are built and how reliable they are. The Tacoma I had previously was a really REALLY good truck. I loved the Tundra, too, but when I had a fourth kid, I wanted a truck that I could fit my whole family in. I was looking for a Tundra with a bench in the front to fit my whole family, but I couldn't find one that had a bench and leather... apparently you can't do that unless you get it custom. 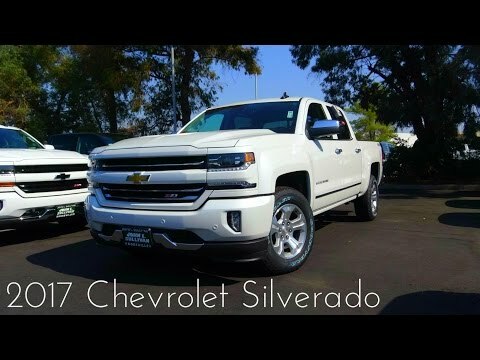 I started looking at the Silverados and found one with a bench AND leather, and it also has a lot of the new tech that Toyota doesn't have (remote start, apple carplay, heated seats, touch screen, auto headlights, etc). These all weighed heavily in our decision to purchase a Silverado instead of a newer Tundra. I still believe that Chevrolets aren't as reliable as Toyotas, but for what we paid, I feel like the Silverado was a better deal with all the extras that I love. This truck is perfect. It's a very smooth ride for a truck and it's also very roomy. It's a half cab but feels much bigger. It easily fits 4 comfortably. Work wonderful for long road trips and the gas mileage is surprisingly very good. I drive roughly 30 miles a day to get two and from work and the tank will usually last me a week and a half to sometimes two weeks. Overall the vehicle is amazing and handle extremely well. Very sleek but also can be a great work truck. I bought this car used and have had little problems with it. It is very reliable. It is not the best in gas mileage but I love the features it has. For a 2008 it had new technology that other vehicles did not offer. It is been in the shop for a recall on the airbag. Other than that I have not had it in the shop for any repairs. If this model was available in a newer year I would definitely buy it again. GM will notify owners, and dealers will provide a corrected insert for the owners manual, free of charge. The manufacturer has not yet provided a notification schedule. Owners may contact GM customer service at 1-800-222-1020 (Chevrolet), or 1-800-462-8782 (GMC). GM's number for this recall is 17307.